And shoved the shivering Jayhawks through the ropes. Guy Chamberlin was born on a farm near the Gage County village of Blue Springs in the southeast corner of Nebraska. According to family lore, his farmer father dropped the “a” from their last name in order for it to look and fit better on their grain sacks. This entrepreneurial action however did not stop university yearbooks and later the Staley Journal and Decatur press from always misspelling his name. In 1911 and 1912 Guy attended Nebraska Wesleyan University and was a star left half back on the Coyotes [now “Prairie Wolves”] conference champion football teams. Recruited to move over to the University of Nebraska, he sat out the 1913 campaign before becoming part of Coach Ewald O. “Jumbo” Stiehm’s “Stiehm-Rollers” which won 15 and tied one game during “the Champ’s” two years as a Husker. 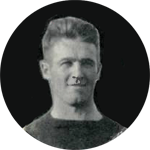 Chamberlin earned All-Missouri Valley Conference honors as a halfback in 1914 before earning All-America honors as an end in 1915 when the team captured the Missouri Valley Conference title. After graduating from Nebraska, Chamberlin stayed in state and taught high school science and coached in Lexington until going into the U.S. Army from 1918 to 1919. Lt. Chamberlin served part of this tour as the athletic director at Camp Kearney in California . On January 3, 1919 he married Lucile B. Lees, the daughter of the University of Nebraska Provost. That fall he played football for his idol, Jim Thorpe in Ohio on the independent Canton Bulldogs and twice traveled to Cubs Park in Chicago to play against George Halas and the Hammond All Stars. Perhaps it was Chamberlin who broke opposing end Halas’ collarbone in Canton’s November 27 win, thus making a lasting impression on him. The following fall Halas heavily recruited the talented Nebraskan [now an Ohio insurance agent] to come work and play for Staley. Whatever Halas promised must have worked as Chamberlin signed a contract on October 5, 1920, and even though he didn’t play in the first game and scored no points that season, he was paid more than any of the other players. After the football season Guy kept working at the Staley plant as he played basketball with several teammates and starting in April 1921 played on the baseball team with Halas. He also placed in several events on September 17 in the 2nd Annual Staley Track & Field Meet. Legend says he once ran the 100 yard dash in 10 seconds flat. That fall Chamberlin started all 12 games at left end and scored 3 touchdowns. None was bigger than his interception and 90-yard run back in Cubs Park on December 4, to defeat the Buffalo All-Stars to clinch the National Championship, his first of five as a player. In 1922 Chamberlin returned to Canton as a player-coach and over the next two years the Bulldogs went 24 games without a loss and won the first NFL back-to-back championships. Although he later said, “I love the game. That’s why I play it. I might make more money in some other line of endeavor so it is not the ‘sugar’ that keeps me at it,” he also remembered that he got paid $7000 for those two seasons! The Bulldogs relocated to Cleveland in 1924, where Coach Chamberlin played in all nine games while winning a third consecutive NFL title. [They split their home and home games with the Bears.] When the Cleveland franchise had financial difficulties he moved on to Philadelphia and become the player-coach of the Frankford Yellow Jackets. After a sixth-place finish in 1925, the Yellow Jackets rolled to a 14-1-1 record in 1926 to give Chamberlin his fourth NFL championship in five seasons as a coach. Retiring from coaching and playing, Chamberlin lived in East Cleveland, Ohio with his wife and daughter Patricia and worked as a salesman. As the Great Depression deepened he returned to his beloved Blue Springs in 1932, where he became a farmer and stockman. His last sports work may have been as high school football coach for the Wymore Zephyrs in 1939. He and Lucile divorced and he quit farming in 1940 and bought a tractor dealership. In 1941 he married Bernyce Weeks and in the 1950s they moved to Lincoln where he worked at the State Reformatory while Bernyce became an interior decorator. In 1962, in addition to his College Hall of Fame honors, the Reformatory named its football field in his honor. On September 12, 1965 he was admitted into the NFL Hall of Fame, the fifth Staley player elected. His official professional coaching record was 58 wins -16 losses-7 ties. Nicknamed “The Champ” during his college career, he was also named to the 1920’s NFL “All-Decade Team” and in 1971 to the Nebraska Football Hall of Fame. On August 15, 2014, the citizens of Blue Springs dedicated a 4-foot red granite marker to his honor near the site of the original Blue Springs High School. A school that was too small to have a football team when “The Champ” was a student.